The Point Form Die (PF-1) puts the ogive curve on a lead or jacketed bullet. It is used after the core has been seated in the core seating die, which in turn is used after the core has been swaged to proper weight in the core swage die. 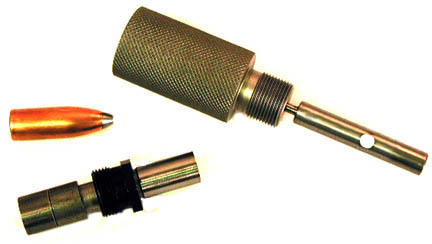 The PF-1 die is the third die of a 3-die set, the most commonly used set of swaging dies for jacketed bullets. Point forming dies have the curve of the bullet shaped smoothly into their die cavity walls, and do NOT use a nose forming punch. The internal punch is used to eject the bullet. Except for special versions of PF-1 dies, the internal punch is a fixed length tempered spring wire attached to a punch head, which in turn is retracted by a steel pin or ram spring when the press ram is raised. The internal punch is basically an ejection pin , and has nothing to do with the shape of the nose (with the exception of custom tip shaping punches used to maintain hollow cavities, teeth, splines, or other special effects). The ejection pin (internal punch) pushes the bullet out by its nose. This means the material must spring back slightly and release its grip on the die. To insure this happens, the core is seated and the main body or shank of the bullet is formed in the CS-1 core seating die, prior to forming the ogive. In this die, the body or shank of the bullet is made slightly smaller than the bore of the point forming die (less than .001 difference). Then the slight amount of pressure used in the PF die to shape the ogive can also expand the shank this small amount, and it will spring back very slightly toward original diameter to release its grip on the die. The current -S dies use an internal punch with a hole, and a long stop pin that passes completely through the ram. The stop pin locks the internal punch securely to the press frame, so it cannot move with the die. The purpose of securing the punch with a stop pin is to provide positive retraction of the punch when the ram is raised, so that the jacket cannot form around the end of the punch. The stop pin must be pulled straight out of the press front and inserted so it goes through the hole in the ejection punch head (internal punch). The older type -M dies for the Silver Press used a slot in the internal punch to hold it securely to the press frame, with a short stop pin inserted in the front of the press. Dies with slotted punch heads require a short stop pin, catalog number STOPPIN1. 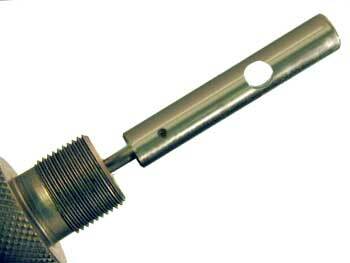 This is an optional part that you can order for use in current presses or as a replacement in earlier presses. The current dies used the long stop pin, catalog number STOPPIN2. One comes with the press. There are several variations of PF-1-S and PF-1-H point forming dies which use a "synchronized" pressure-sealing ejector punch, instead of the ejection wire style with the head pinned to the press frame. These "SYNC" style punch and die sets can do jobs such as combining weight adjustment, hollow point forming, ogive shaping, and base forming into one quick stroke. 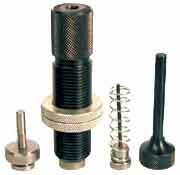 They require precisely matched punch lengths for the die cavity, and may have features such as bleed holes in the die wall, and interchangeable ejector rod inserts for the internal punch. They are designated with a letter added to the catalog number, such as PF-1-SL for a lead bullet swage, PF-1-SP for a pellet swage, and the PF-1-ST for metal tip seating die with two ejectors (one to form a cavity for the tip insert, and one to push the tip insert and bullet out of the die). There are also custom versions which require making special laps and reamers to produce the die, rather than standard tooling. Any time that the diameter or the ogive shape is non-standard, it requires custom work to make the tooling. Even combining a standard shape with a standard caliber in a way that is not normally done, such as putting a long rifle ogive on a pistol caliber, may require custom work: for instance, if you want a 6-S ogive (standard rifle shape) on a .44 Magnum (.429 diameter), that would be unusual and not a standard combination, which means that a special reamer and set of laps is required to make the die. If the only special or custom features are either the shape or the caliber, or a non-standard combination of them, then the lower priced PF-1-SD or PF-1-HD is the best option. The "D" means "dimension" and can be either diameter or shape. The PF-1-HC is a more comprehensive "Custom" designation, which can include a lot of special features beyond just shape or diameter. It may include bleed holes, synchronized pressure sealing ejectors, special threads or diameter of die for unusual presses not built by Corbin, and in general is priced to cover all the additional engineering and machining that might be required beyond making new reamers and laps. The PF-1-H and PF-1-S can each have an additional letter added to help indicate the right design and price for the specific features desired. 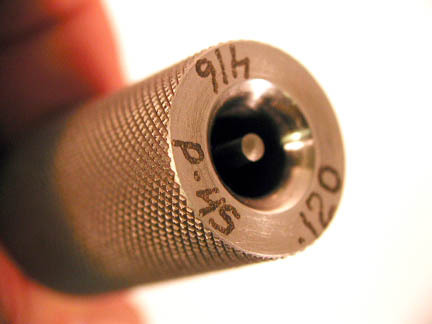 The standard PF-1-H and PF-1-S are ONLY used for standard point formers, 90% of the point formers ordered. They have one of the standard ogive shapes listed for the caliber range, and one of the standard calibers (diameters). Anything else will have a different price and letter designation. The discussions about PF-1 dies refer to the standard dies, and may or may not also apply to various custom designs. The CS-1 Core Seat die must be made to match the PF-1 point form die. The two are a carefully matched set. Using a .308 core seater with a .311 point former will result in a badly tapered bullet, swollen randomly at the base and at a point where the ogive contacts the jacket, and undersized in the center, or perhaps tapered badly from base to nose. It could also result in an undersized bullet with a swollen base. Using a .225 core seating die with a .224 point forming die would probably result in the bullet being very difficult to eject, sticking in the point forming die, and possibly driving the ejection pin through the bullet. Use the correct core seater with your point form die! 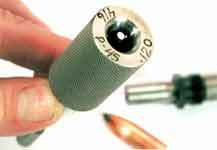 Sometimes, a person wishes to "bump up" a smaller commercial bullet to larger diameter, such as making a .311 bullet out of a .308, or a .228 bullet out of a .224. While this is possible, the results usually are not quite the same as making a bullet by properly swaging it in a 3-die set. 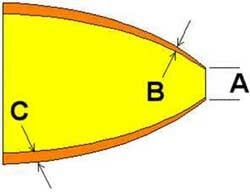 Putting the undersized bullet into the larger point forming die is the same as using an undersized core seater die: you get the same kind of taper, bulging, and other problems that would not occur if the bullet were swaged from a core and jacket. The pre-existing ogive and nose shape have an effect on the operation, as well, so sometimes it works reasonably well, and sometimes it doesn't. We can provide the point forming die to use as a "bump up" die for jacketed bullets, but we cannot guarantee the results. This is a "try and see at your own expense" proposition, because whatever bullet you choose to bump up will have an effect on how well it works...even the same diameter and weight and shape of bullet from a different manufacturer or different production run can have enough difference in its jacket hardness, thickness, core material, and other springback factors so that the diameter and taper are different, using the same "bump up" die. The good news is, that the same point form die you order for "bumping up" a bullet will be the same one you need later if you decide to do it right and make your own bullet. So, it isn't a waste of money. You can just add the core swage and core seater, and swage excellent bullets of the proper weight and diameter. One of the first things that people seem to want to know is how small they can close the tip of an open tip rifle bullet, in a point forming die. The ejection pin diameter is the smallest possible tip closure. Ejection pin diameters are established for each caliber based on the ejection pressure, and the amount of bending force that a tempered spring wire of that diameter can handle. Smaller diameter pins are used on smaller calibers, but the range is typically from .062 to .120 diameter for calibers in the .123 to .458 range. Asking for a .050 tip means requiring the use of a .050 ejection pin. This would be so long, thin, and fragile that you would have very poor life expectancy for this part. It might also concentrate enough force in one spot on a lead tip bullet to penetrate rather than push the slug out of the die. Lead tip forming die (LT-1) used to push the tip closer together. This works to a limited degree, depending on how thick and strong the end of the jacket is, and the ogive curvature. A very pointed (8-S or more) bullet can be pushed together with a LT-1 lead tip forming die more easily than a blunter nose. A commercial thin-wall jacket can be closed smaller than a thick copper tubing jacket. Bullet Fixer die (FX-1) used to reshape the ogive and push the tip together. 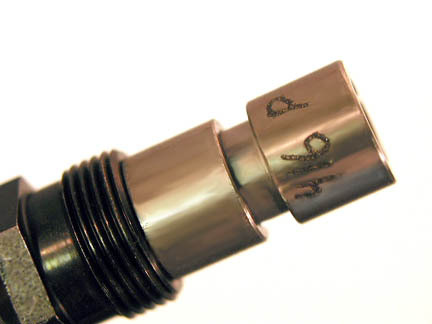 This works reasonably well with any shape or caliber, but is somewhat expensive because of the nature of the FX-1 high pressure sealed chamber die. It will produce a virtually closed tip, however, if the material itself is thin enough to allow it. (Obviously if the jacket wall is .05 inches thick at the end, the smallest possible closure would be when the inside diameter is zero, leaving the outside diameter at twice the wall thickness, or 0.1 inches across). Tip inserts can be inserted into the bullet nose. 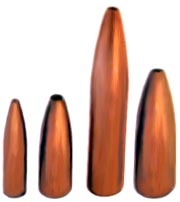 The inserts can be formed from small jackets, such as .17 or .22 caliber, shaped into a point on the base and inserted so their point becomes a "nose cone" within the larger caliber. A custom point forming die can be built with a special tip closing internal punch. The punch is adjustable so that its internal curve can be set precisely to match the curve of the die wall regardless of slight variation in the press ram and other components. This is like a combined point form and lead tip die, and the only drawback is the additional cost associated with the more complex punch design. To see information about standard ejection pin diameters and replacements, click EJECTION PINS.